The application of circular dichroism (CD) to various problems involving con- formation of proteins and other biopolymers is emphasized in this revised and enlarged second edition. The usefulness of CD and ORD in helping to solve structural prob- lems is demonstrated by many examples, and the most essential data are tabulated. The author is sincerely grateful to the editors of the series Molecular Biology, Bio- chemistry and Biophysics, especially to Professor GEORG F. SPRINGER, M.D., for their interest in this edition, as well as to the many reviewers for their constructive criticism of the first edition of this book. Our previously unpublished work reported in this second edition was supported in part by grants from the R. A. Welch Foundation (grant G-051) and U.S. Public Health Service (grant CA-01785). 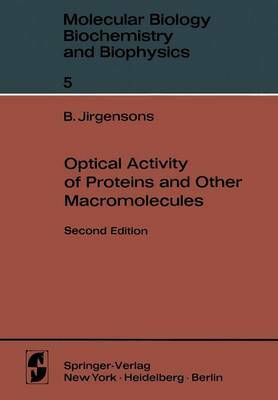 Houston, September 1973 B. JIRGENSONS Preface to the First Edition Great advances have been made in the application of physical methods in the study of the structure of proteins and other biological macromolecules. Optical rotatory dispersion has been successful in solving structural problems, and a vast amount of literature has accumulated on this subject. Several review articles appeared between 1961 and 1965, but significant progress has been made since 1965. Important new studies, especially on the Cotton effects in the far ultraviolet spectrum, have rendered many previous publications obsolete so that a concise monograph should be useful at this time.